In our "CEO Insights: 2019 Cybersecurity Predictions" webinar, Brian NeSmith, CEO and co-founder of Arctic Wolf discusses his top predictions for 2019, based on what our security services team has seen across more than 500 customers. 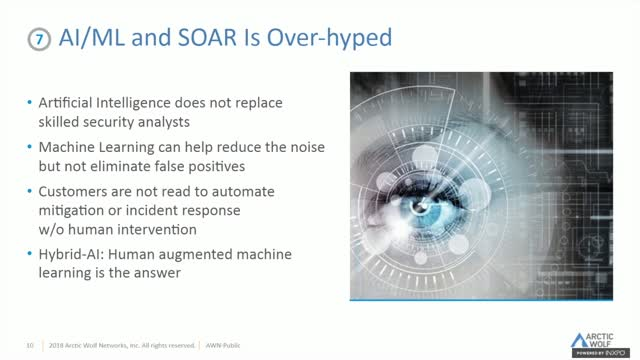 One of the things he predicts is that AI/ML and SOAR is over-hyped. How so? Watch this brief video clip to find out why. For modern businesses, a Security Operations Center (SOC) is no longer an option. It is a necessity. But building and maintaining a fully functional SOC is a daunting proposition. Cost is a top consideration, driven overwhelmingly by a SOC’s need for a high number of in-demand security experts. Hiring, training, and retaining the necessary talent to staff a SOC is flatly impractical for many businesses. Fortunately there is a viable alternative to a DIY SOC: SOC-as-a-Service. A 17-year veteran at Frost & Sullivan, Michael Suby, VP of Research, has concentrated on the evolving threat landscape, practices, and technologies in cybersecurity. Quick to engage on risk and response, Mr. Suby habitually examines emerging cybersecurity technologies before they reach mainstream. Recent examples include server-less security, deception, dynamic defenses, content disarm & reconstruct, remote browser isolation, and cloud access & security brokers (CASB). In partnership with a team of highly experienced cybersecurity analysts at Frost & Sullivan, Mr. Suby is also intimately involved in researching how traditional cybersecurity solutions and platforms are addressing the diverse challenges and pressures encountered by IT and security practitioners. With the growing IT security skills shortage, many enterprises simply do not have the staff they need to handle new projects or ongoing threats. In addition, many businesses are increasingly relying on network and cloud service providers, taking key security functions out of their hands. How can enterprise security teams work with third-party contractors and service providers to improve overall security? In this Dark Reading & Arctic Wolf webinar, top experts discuss security outsourcing strategies, tools for measuring service provider security, and ways to use third-party services to supplement your in-house cybersecurity skills. Save your seat now to learn more! With the major cyber-attacks headlining the news, many of these cyber threats fall into five different attack vectors. Whether it's user credentials, personally identifiable information (PII), payment card information, health care information, intellectual property, or another form of data, nothing is safe from these bad actors. So, how do you protect you and your business from these debilitating attacks? In our upcoming webinar, we arm you with the essential components needed to defend your business against the top five attack vectors we see in a Cyber Security Operations Center (SOC). Register now to understand the different ways an attacker may cause harm to you and your business and how to defend yourself moving forward. At Arctic Wolf, we continually encounter IT security myths that persist among businesses of every size. Isn’t antivirus all you need for cybersecurity? Aren’t large enterprises the only ones affected by data breaches? 24x7 security monitoring is overkill, right? These myths can significantly impact strategic IT decisions and put your business operations at risk. These are the kinds of questions, myths, and cybersecurity urban legends we’ll explore in this webinar. Discover what’s true—and what’s simply a myth. Let the Arctic Wolf Cybersecurity Mythbusters team educate and entertain you. Save your seat now! And click here: http://bit.ly/2B3lyFv for part one of our six-part “mythbuster” blog series. Monitoring and detecting threats in healthcare faces a number of challenges: sophisticated cyberthreats, HIPAA compliance requirements, budget constraints, and a cybersecurity talent shortage for staff needed to monitor and respond to events. Previous approaches to monitoring have been ineffective and expensive. Managed detection and response (MDR) services provide a way out of this cybersecurity conundrum. This webinar explains how healthcare organizations can improve cybersecurity and compliance with MDR/Security Operations Center (SOC)-as-a-service. • The ways a managed detection and response (MDR) service differs from managed security services (MSS). • How MDR/SOC-as-a-service provides big savings compared to in-house security info and event management (SIEM) tools. • How MDR/SOC-as-a-service helps to fulfill HIPAA compliance requirements. • The ways an MDR/SOC-as-a-service improves healthcare security posture and alleviates the cybersecurity talent shortage. Vulnerabilities, threats, and risks are commonly mixed up security terms. Several cybersecurity solutions available in the market today give you independent analytics in each of these areas. that does not give you complete understanding of your overall risk posture. In this webinar, Narayan Makaram, Sr. Director of Product Marketing at Arctic Wolf Networks, will cover the following topics to enable you to address cyber risk. Data breaches are now a common global occurrence, causing real economic damage to businesses. Lost revenue, damaged reputations, disrupted operations, and significant costs to recover, attackers are adapting their techniques at a much faster pace than most businesses. These once less sophisticated cyber criminals now have easier access to exploits that were previously only available to highly skilled nation-state actors. Without access to the large IT budgets to fend off these bad actors, small and medium businesses continue to struggle with determining the right approach to cyber security. Lacking the resources to build or staff a Security Operations Center (SOC), companies continue to invest in endpoint and perimeter security products. However, even with several security products deployed, breaches keep occurring. So, is there a way you could detect data exfiltration attempts early, even if the attackers were able to evade your endpoint defense mechanisms? To discover why 24x7 monitoring is critical, register now. It is not a matter of if but when a data breach will occur, and whether your IT organization is prepared to detect and respond to it. Experienced hackers are constantly inventing ways to get through your defenses and steal company confidential data or personal identifiable information (PII) to make money. Focusing on prevention alone is not sufficient. Brad Bierman, Director of Security Operations at Arctic Wolf Networks, and his team of Concierge Security™ Engineers have helped hundreds of customers detect and respond to data breaches. He will walk through a few cyberattack scenarios and provide expert tips on the following. 1.What tools do you need to have in place to detect a data breach? 2.Who do you need to engage to respond to a data breach? 3.How do you respond appropriately to data breach? To learn more, join this webinar! Brad Bierman has over 17 years of varied experience in the information security field. Some highlights are communications interceptions, SIEM engineering, mobile and computer forensics, security monitoring, and incident response. Prior to becoming a security professional, Brad was a hardware/firmware engineer for embedded networking solutions. A security information and event management (SIEM) platform has been touted as the cornerstone of cybersecurity. But, can such a stand-alone platform address your IT security challenges and compliance reporting needs? With the growing complexity of SIEM solutions and a shortage of people with cybersecurity skills to manage them, many organizations are looking for alternatives to building their own in-house SIEM and staffing a security operations center (SOC). Managing sensitive financial information and combatting cyberthreats often means finding efficiencies to do more with less. Modestly staffed IT teams often find themselves overwhelmed and challenged to complete projects that benefit the top line while also improving their cybersecurity maturity and meeting compliance obligations. With such a wide breadth of responsibility, how can small and mid-sized financial institutions counter sophisticated cyberthreats, provide monitoring and incident response needed for compliance, and do so with tight budgets that do not allow for staffing or building an elaborate security operations center? Managed detection and response provides a “force multiplier” to address all three issues. 1. Doing more with less: how to free up resources to accelerate projects affecting the top/bottom lines. 2. How is SOC-as-a-service different than conventional managed security service provider offerings. With the start of 2019, there’s one certainty: this year’s attacks are destined to be more destructive and prevalent than ever before. So, how are cybersecurity experts and vendors gearing up to protect themselves in the face of these new challenges? In this webinar, we address major industry trends like machine learning and security orchestration, automation, and response (SOAR), and also dive into how three key innovations—hybrid AI, hybrid cloud security, and hybrid IT teams— enable any organization to deploy world-class defenses. See how you can beat the big threats of 2019, save your seat now! Gone are the days when IT security departments worried about building and managing a secure “perimeter,” and spent an abundance of time managing passwords and access control lists. Security operations centers (SOCs) now do more than simply monitor networks and systems for signs of common cyberthreats; security teams analyze and respond to new, zero-day attacks that evade traditional defenses. In this panel discussion led by Dark Reading’s Executive Editor Kelly Jackson Higgins, top SOC experts and leaders from Arctic Wolf and elsewhere offer war stories and recommendations on how to implement the latest tools and practices in SOC operations. You’ll learn how to prepare your organization for the next major security incident, even if your enterprise doesn’t have a SOC in place. Compromised client information can destroy reputations and lead to decreased billables and lost business. While the need for improved security is evident, IT and security teams struggle to locate, retain and train talent needed to maintain and improve their security posture. So, what are optimal approaches for law firms to manage staffing needed to monitor and defend their valuable data and infrastructure? Save your seat today to learn more! Attack surfaces are rapidly changing by the minute, as IT organizations are provisioning new types of endpoints, IoT devices, servers, web-applications and cloud-based services to increase business efficiencies. Due to this dynamically changing asset landscape, it has become increasingly difficult for IT security teams to maintain visibility to which ones need to be patched to reduce the risk from being exploited by hackers. Narayan Makaram, Sr. Director of Product Marketing, Arctic Wolf Networks, will explore the following, to emphasize the need for regularly running external vulnerability scans to boost your visibility and reduce business risks. Register today to hear from this expert! Last year was all about large Ransomware hacks like WannaCry, Petya/NotPetya, and CRYPSHED to name a few. These various strains of Ransomware can bypass your perimeter controls and infect your critical systems, bringing your business to a grinding halt. However, focusing on prevention technologies, with point security products, may not be sufficient enough to fight these key security concerns. So, what are your options? - How do you detect and respond to a ransomware attack? - What is coming next in the world of ransomware? To discover how to fortify your network with 24/7 monitoring with managed detection and response, register for our upcoming webinar. Dinah Davis is the VP of R&D at Arctic Wolf Networks, responsible for the development of the AWN CyberSOCTM product. Dinah holds an M. Math in cryptography from the University of Waterloo. She has over 16 years of experience in the tech industry with time spent as a Security Software Developer at the Communications Security Establishment Canada and BlackBerry, and as a manager at TrustWave and D2l. Dinah is also the founder of Code Like a Girl, a publication whose goal it is to change society’s perceptions of how women are viewed in technology, which has over 36,000 subscribers and a vibrant online community. Artificial Intelligence and Machine Learning are impressive but not yet able to completely replace security professionals. So, what is the right solution for you and your organization? In this webinar, we will demonstrate the shortcomings of using both technologies, without a security professional in the loop, and make the case that coupling the experience and intuition of a security professional with a machine learning system, can greatly improve the overall results. We will also tap the insights of Arctic Wolf Networks's Chief Architect, Matthew Thurston, on how Hybrid-AI and Machine Learning can improve threat detection capabilities and reduce false positives. Matthew Thurston developed his technical vision and security industry experience working over 10 years at Blue Coat Systems as a key developer of the policy enforcement system. He was a co-inventor on patents covering network policy management and optimizing MS Exchange (MAPI) traffic. His work reverse engineering the MAPI protocol gave birth to his keen interest in all things packet-related. Prior to Blue Coat, Matthew cut his teeth as a developer working on a wide range of projects including laser projection systems at Virtek Vision, ergonomic automation at HumanCAD Systems and configuration management software at MKS. Matthew is a graduate of the University of Guelph with a bachelor of science in computer science. As the rapid digitization of business processes continues, the risks from cyberattacks have become increasingly daunting. Data breaches can disrupt business operations and cause significant economic damage, especially to businesses that don't have the resources to build a fully operational Security Operations Center (SOC). Smaller businesses often incorrectly assume that investing in endpoint and perimeter security products is enough to keep them safe. This approach is now outdated and ineffective. To see why SOCaaS is the Right Choice, save your seat now! Every company, regardless of size or industry, needs the advanced security capabilities provided by a security operations center (SOC). Until recently, only large enterprises had the means and resources to implement these essential technologies. So, where does that leave small to midsize enterprises (SMEs)? In this upcoming webinar, Co-founder and COO of CyberEdge Group, Mark Bouchard, will share insights on the cybersecurity challenges facing small to midsize enterprises (SMEs), drawing on data from the recently published 2018 Cyberthreat Defense Report. We will also hear from Sr. Director of Product Marketing of Arctic Wolf Networks, Narayan Makaram, on the SOC options available to SMEs and will help to identify the top 10 capabilities to look for in a SOC-as-a-service. To discover how SMEs can get access to a SOC in the form of a SOC-as-a-service, register today! Mark Bouchard, CISSP, is the Chief Operating Officer at CyberEdge Group, an award-winning research, marketing and publishing firm serving the needs of high-tech organizations worldwide. Before CyberEdge, Mark founded AimPoint Group, an independent IT research and consulting company specializing in information security. Prior to AimPoint Group, Mark was a Vice President at META Group (acquired by Gartner) where he helped hundreds of organizations worldwide address their IT challenges. A veteran of the U.S. Navy, Mark is passionate about ensuring the success of his clients. In this webinar clip, top security operations center (SOC) expert, Sam McLane, shares a key war story on how attacks appeared in a targeted organization, the steps taken to correlate information about the attacks, and the development of an effective mitigation strategy. In our recent "Top 5 Reasons Why SOCaaS is the Right Choice" webinar, security expert, Louis Evans dives into the top reasons why there's been an increasing shift towards outsourced security operations across businesses in a variety of industries. In this brief webinar clip, we share one of those reasons. To see what you get with SOC-as-a-Service, check out this clip now! Arctic Wolf Networks delivers the industry-leading security operations center (SOC)-as-a-service that redefines the economics of cybersecurity. The AWN CyberSOC™ service is anchored by Concierge Security™ teams who provide custom threat hunting, alerting, and reporting. Arctic Wolf’s purpose-built, cloud-based service offers 24x7 monitoring, vulnerability assessment, threat detection, and response. For more information about Arctic Wolf, visit https://arcticwolf.com. Don't forget to follow us on Twitter @AWNetworks!